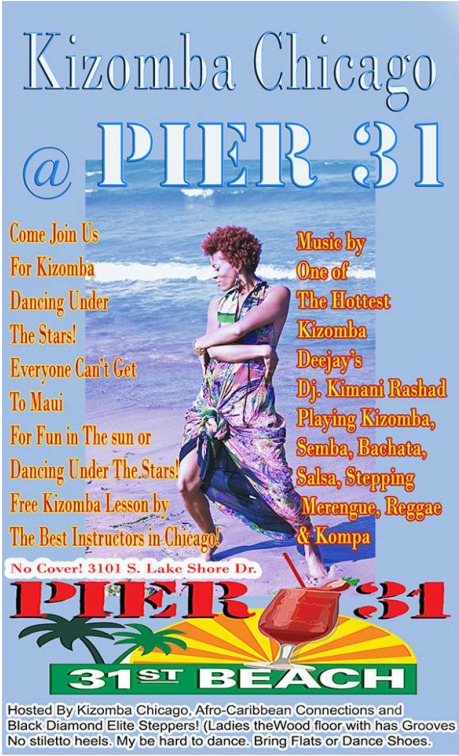 Dance kizomba and more (semba, bachata, salsa, stepping, merengue, reggae and kompa) under the stars to the beats of Kimani Rashad; the leading Chicago DJ who has been at the forefront of the kizomba movement! The night includes a free Kizomba dance lesson! Arrive early! Pier 31, the restuarant, is THE place for great food, a cold drink or just to visit with friends and family. With an expansive deck looking over Lake Michigan at the 31st Street beach, Pier 31 is just footsteps from the sand, beach and boating docks. Go for fun in the sun or to wind down after a hard day at the office. Pier 31 has an EXCELLENT view of the fireworks show on Wednesdays. They make for a wonderful date night! The fireworks begin at 9:30pm!